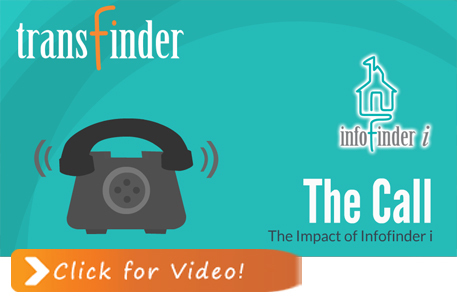 Infofinder i is your transportation department’s link to the community. 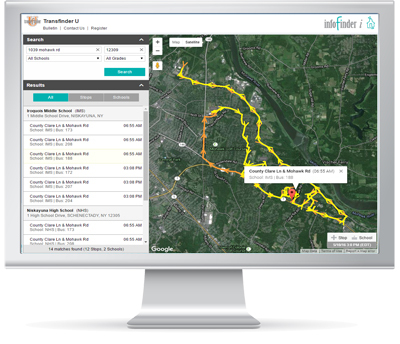 Infofinder i is a Web-based service that leverages your investment in Routefinder Pro to share route and stop information via your district’s website. Your transportation department’s link to the community with school bus routing information with infofinder i.
Seamlessly integrated with your existing district Website, Infofinder i is a Web-based service from Transfinder that gives you the flexibility and power to easily provide your route and stop information to the families in your district. Instantly inform parents and guardians with email notifications. After entering an address, Infofinder i displays all the schools, bus stops and routes on a detailed map. 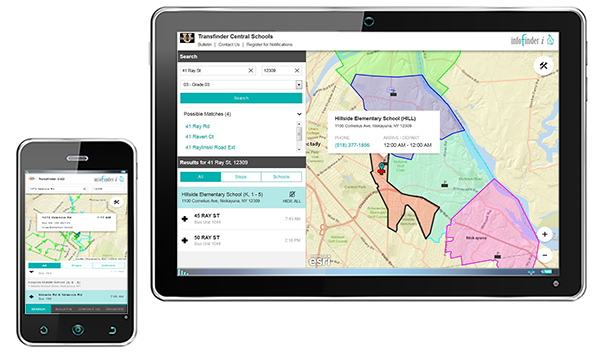 The map clearly identifies the household, schools and bus stop locations for parents and guardians to view on your district’s website. With Infofinder i’s notification system, parents can register to receive important notices related to schedule, stop or vehicle changes. You create the message, you decide when to send it, and we do the rest. Emails contain your message and helpful links that show the student’s mapped household and stop information. Sign up online for automatic notifications, and submit questions and concerns. Provide easy data access for all involved with the district. Provide unlimited electronic notification at no additional cost. By entering a student’s address, parents and district personnel have access to an interactive map of all available trip stops, trips and schools a student is eligible for. Users can pan and zoom the high-resolution map, and choose from over 10 best-in-class ESRI map displays to view the areas surrounding stop locations. Infofinder i is fully configurable from your desktop. You decide if you want to show stop times, bus routes, bus names, am/pm trips…it is in your control. You select the data that is displayed on your site. Only your district maps, schools, routes and stops are uploaded to our servers. At no time do we transmit, store or display any student related data. Since Infofinder i is a service, all you have to do is upload your data to our secure Infofinder i server, add some simple links to your existing website, and we do the rest. Only your district maps, schools, routes and stops are uploaded to our servers.